Every year, the day after Halloween I take down all my decorations and start decorating here and there for Thanksgiving. I am just not one of those people putting up their tree the first week of November,though I do put up decorations the day after Thanksgiving. With the craziness of Halloween, I like to take a break from the overstimulating decorations before Christmas starts and my house is full of red and white. I like to keep things neutral and simple for a few weeks. I also like to take these few weeks to slow down and focus on family, and not the hustle and bustle of non stop christmas shopping, parties, events around Denver etc. Something that drives me absolutely crazy is the way most stores do holidays. After Halloween they skip straight to Christmas, and for those of us that just need a little break from the busyness of it all, it is frustrating ! I really could care less if everyone else around me is in full Christmas spirit already, I totally get it! What bothers me is that I have to HUNT to find Thanksgiving/Fall decorations because everything is already gone. I went to Michaels on the 3rd of November, thinking that with 22 days still until Thanksgiving, I was going to be just fine to find a leaf garland. NOPE. The employee looked at me like I was crazy when I asked her where the Fall section was and pointed me to the tiny two shelves of 80% off section of Autumn decor. Maybe I am just always behind, but oh well. To me, taking the break from events, parties, and decorations for a few weeks in November is much-needed. Because as soon as it’s the day after Thanksgiving I am turning my home into a Christmas wonderland! ( And maybe even earlier this year, who knows). To keep things bright, simple and beautiful, I went with a white, cream, and light blue color palette. The different shades of green in the garland adds a perfect touch of nature. Spiced cider + plain donuts is the perfect combo. Whether you are hosting a Fall party at your home or just want to have a little cider and donuts party with your kids, here is some inspiration to make it beautiful and simple. Because I couldn’t find any garlands in store, I decided to make my own! This was super simple but a bit tedious. I bought a few bouquets/bunches of this pumpkin and succulent floral arrangement from Michael’s and separated different stems with wire cutters. I started laying them out on top of the bar cart to get a feel for how I wanted it to look. Then using green floral wire, I tied the stems together in the middle. I bent the stems different ways to give it a more flowing look and then took tiny bunches of little white flowers and stuck them into the garland where it needed to be filled. I then laced the twinkle lights through the garland. What is wonderful about this project is that you can use just about any type of floral arrangements and make it however long or short you want. And because I just used wire and not hot glue, I can easily take this apart and use these for other projects. If you are worried about people knocking the garland down, you could use some tape to lightly secure it to the top of the bar cart. OR place the garland on the bottom shelf and leave the top clear for easy drink-making. I just love the little pumpkins and succulents! Pour an entire bottle ( ) of chilled spiced apple cider into a large glass pitcher. Thinly slice one gala apple and add to the pitcher. Add 1-2 cinnamon sticks and chill in the fridge for at least 30 minutes. Add a wooden spoon to the pitcher so guests can stir up the cider before they serve themselves this delicious bubbling cider. This black letter board would have looked much better hung on the wall, but we are moving in the next few months and don’t want to put more holes in the wall! The gold glasses and straws warmed up all the cool tones while still being a “neutral”. I love using trays on the bar cart because it adds more texture. This white one is from IKEA and I use it ALL the time. It’s perfect for breakfast in bed, putting summer drinks on to carry out to the patio, and using it for parties. Some of these items I got in the bullseye section of Target a couple months ago or last year, but I linked the closest I could find online below! I kept it simple with just cider and donuts but I may be adding some liquor and mixers to this bar cart soon! We spent our Saturday morning eating donuts and sipping cider, loving this beautiful Denver weather and appreciating the little things. I just love having a bar cart, it is so much fun to decorate and also a very convenient serving tray on wheels. I found this old rusty utility cart in the GARBAGE and painted it white. You don’t have to spend a fortune to have a bar cart! Get creative, try to use what you already have, and make it beautiful while also functional! I hope this gave you some ideas for your own Fall bar cart! To check out my Halloween Bar cart go here. This is a spectacular set up. I am not a DIY person but I think I might try this. I love cider and recently got an orange whiskey cinnamon punch recipe. I am looking forward to my serving table! Oh yum ! That drink sounds delicious! I totally agree with you about skipping straight to Thanksgiving. I think the message of Thanksgiving is so important that it should not be skipped. I have yet to find Thanksgiving socks which irritates me lol. I love the garland and the cider looks delish! I like the color scheme you picked. Thanksgiving is always a lot of brown, but I really like yours. Looks really modern and chic. Great job! What a beautiful set up!! Sent it to a friend because she is very DYI. She is going to try it. Loves the look of it!! 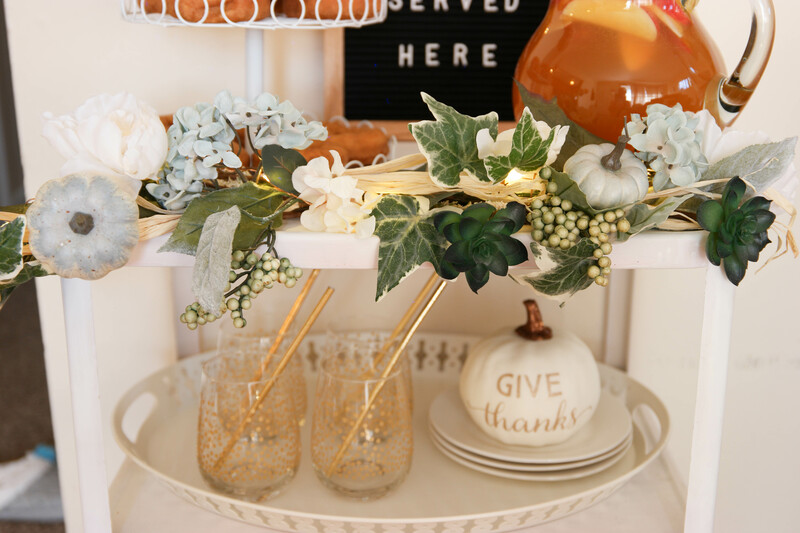 Love your cart and your DIY garland is beautiful! I too get frustrated with how quickly we go from fall to Christmas! Thank you so much ! And glad I’m not the only one ! Love this setup it is so beautiful! It adds an extra special touch to thanksgiving dinner. I usually make a hot chocolate bar for Christmas. Lovely post! I adore the garland! You are so crafty! This is such a cute idea. We are having a few cider drinks for Thanksgiving and I love the idea of having a special place where people can make their own drinks. I love it! Your Apple Cider Bar Cart looks great! The garland and pumpkins are nice touches. This post inspires me to make a sparkling Apple Cider sometime. With two toddlers, I can only imagine them knocking over a bar cart, but in a few years, I would love to try this. I love how creative and the way you share your style on this D-I-Y. Plus I absolutely love Apple Cider wow I can only imagine how delicious this is going to be.